I’ve answered a lot of queries on the Xero Business Community about how to set up Time in Lieu (or RDOs) in Xero. You can see the thread here. This article covers how you can go about tracking hours worked towards RDOs or Time in Lieu and then also how to process pay runs when RDOs are taken. Xero is updated frequently. This article was last revised on 01.11.16 and is current as of that date. If you notice that this article is no longer current, please get in touch with us via our contact page and let us know so that we can revise it. First you need to set up the pay item that you want to use to track the hours worked that the employees aren’t being paid for, (in the short term at least). Go to Settings > General Settings > Payroll Settings > Pay Items > Earnings > Add > Ordinary Times Earnings. Fill out the fields like the screen shot below. You want to make sure that your Earnings Name makes it clear that it’s not hours taken for RDOs, as someone new who doesn’t understand a lot about payroll may easily confuse the two. A few things are important here. Type Hours in the Type of Units field and make sure that you don’t type a space after the word. Enter 0 (zero) as the Rate per Unit. Although you can’t see it in the screen shot, there are more fields underneath. Where it says Expense Account, select the wages and salaries expense account you’d like to link this to. You don’t need to tick any of the check boxes as we won’t be paying any employees using this pay item. 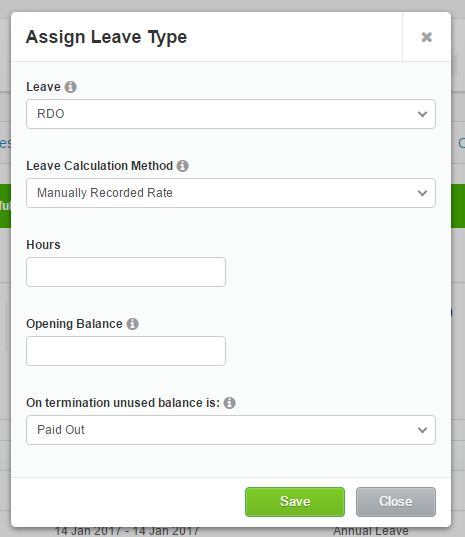 Now click on Leave in the menu on the left of the screen you’re already on and click Add > Paid Leave. If you’re not sure where I mean, this is accessible from Settings > General Settings > Payroll Settings > Pay Items > Leave > Add > Paid Leave. Enter Hours in the Type of Units field and make sure that you don’t type a space after the word. There is an alternative method you can use to accrue RDOs based on the Normal Entitlement field, but if you want to track RDO hours accurately via the timesheet method that I’m guiding you through here, then it’s best to leave this blank. There’s a check box when you scroll further down, which gives you the option to display the balance of the RDOs on the employees’ payslips. Whether you display this or not is entirely up to you. Now we need to set up the employees’ pay templates to accrue RDOs. Go to Payroll > Employees and select the relevant employee(s). Now click on the Leave tab and click on Assign Leave Type. Choose RDO from the Leave drop-down menu. In the Leave Calculation Method field, select Manually Recorded Rate. If your employee already has an opening balance, enter it here. Where it says On termination used balance is select Paid Out. When you’re done, click the green Save button. A screen shot below shows you what this looks like. Just one word of caution here. RDOs paid out on termination often form part of an Eligible Termination Payment (ETP), which attracts different tax treatment as well as needing to be reported separately from the rest of the earnings reported on the Payment Summary (formerly Group Certificate). Now that the set up is complete, you can go ahead an enter your employees’ timesheets. Go to Payroll > Timesheets > Add Timesheet. Select the relevant employee and pay period and click Save. You will need to enter the hours worked that the employee is being paid for. Select the earnings rate required for each line and add additional lines as needed. Enter ordinary hours, overtime hours and whatever else is being paid on an hourly basis. 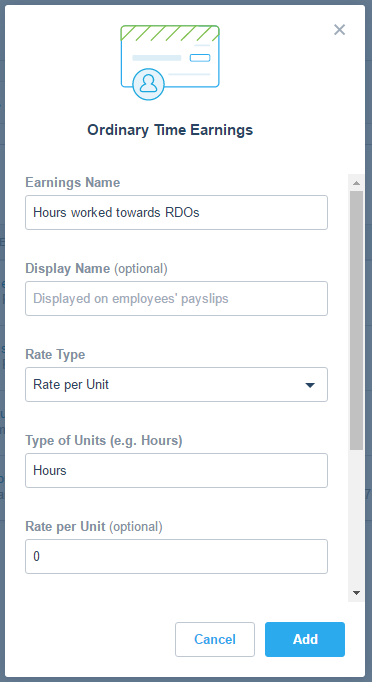 Then select the hourly rate you created earlier, which we called Hours worked towards RDOs. Enter the amount of hours that the employee worked towards their RDOs but is not getting paid for and needs to contribute to their RDO balance. When you’re done, click the green Approve button. You can revert back to a draft if you need to correct anything. Another option that you have is that you can save it as a template to use again next pay period. This will make it quicker next time around and you will only need to enter the variations. See the screen shot example below. We’ve used a scenario of an employee, James Lebron, being paid on a weekly pay cycle. He’s working a 40-hour week but is being paid for 38 hours and the remaining 2 unpaid hours are being added to his RDO balance. So now we’re ready to enter a pay run using the timesheet data entered earlier. 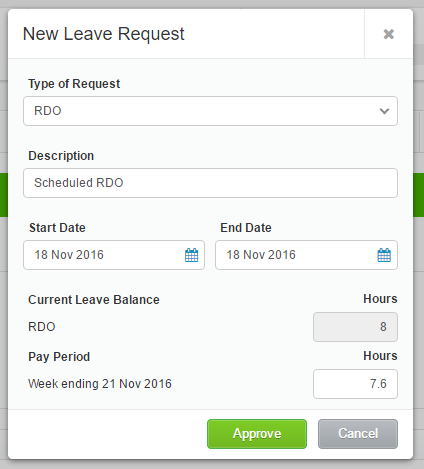 Go to Payroll > Pay Runs > Add Pay Run and select the relevant pay period and click the green Next button. Let’s click into James’ pay to see what’s happening. As there is a lot of information in the pay run that we don’t need to look at for this example, I’ve only pasted two screen shots showing the top and bottom sections of the pay run. The first screen shot shows the hours that the pay run has pulled from the timesheet. Notice how the Hours worked towards RDOs shows the 2 hours, but at a $0 hourly rate. You’ll also notice that the hours are locked. You can’t edit them from this view. If you’ve made a mistake, you’ll need to unlock the timesheet and make the corrections there. The second screen shot shows the bottom section of the pay run for James. The RDO leave type has a blank field. You need to enter the 2 hours from the top section of the pay run into this section at the bottom. Remember to save the changes you’ve made to the employee’s pay and post the pay run. Now click here to have a look at the pay slip to see what the employee sees. You’ll notice that the 2 hours that you can see at the top of the pay run as the payroll administrator are not visible to the employee. The employee will only see the hours they’ve accrued, (and taken), in that particular pay period at the bottom of the pay slip. The reason why we use this method of entering the hours into a timesheet first is so that the payroll administrator is less likely to make errors. By entering the timesheets a day at a time and making sure that the total number of hours match for each day and each week, and that the hours are correctly allocated to each pay item, accuracy is increased. It’s easy to get confused when you’ve got a lot of different pay items and you’re relying on your brain power. If you’re having a bad day or working late at night, errors are just too easy to make. 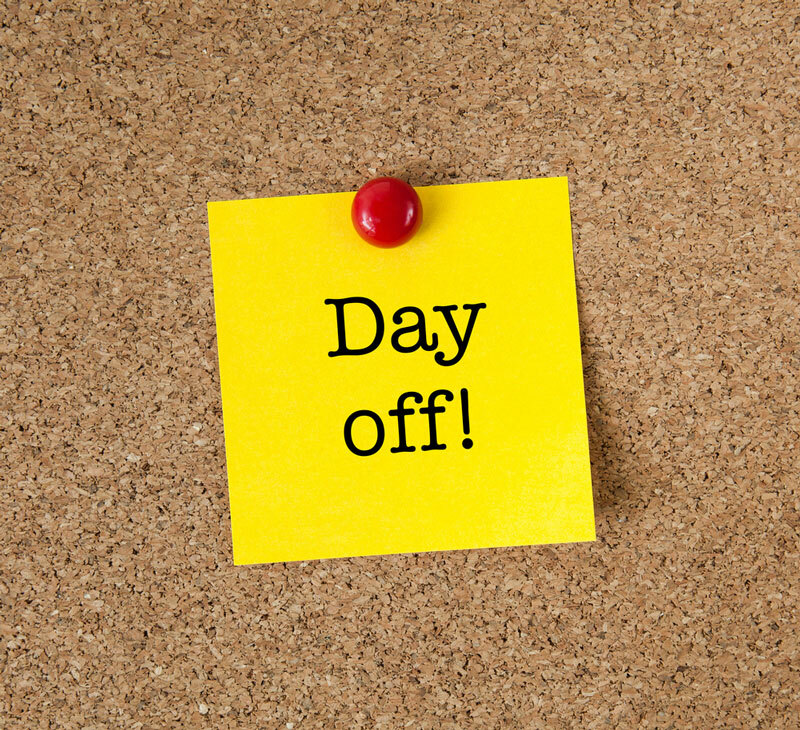 So now we need to look at how to process a day off and an employee using up some of their RDO hours. You’ll need to create an application for leave. As the RDO is effectively being treated as a leave type in Xero, we need to follow the same process as we would if the employee was taking annual leave or personal/carer’s leave. There are a couple of different screens that you can enter this from, but it doesn’t matter which one you choose. Here are your options. You’ll then need to select the employee (option 1 only), leave type taken, description, start and end dates and confirm the total hours. The screen shot below shows you what this step looks like. You’ll notice that the number of RDO hours currently available shows up here. 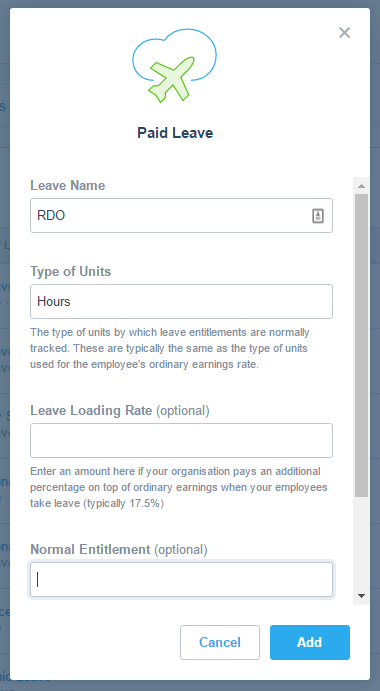 You can then decide whether or not to let an employee have a negative RDO balance after you’ve entered the leave request. When you enter the timesheets for the week that the employee is taking an RDO, enter only the hours worked. In this example I’ve entered 4 days at 7.6 hours each for James. 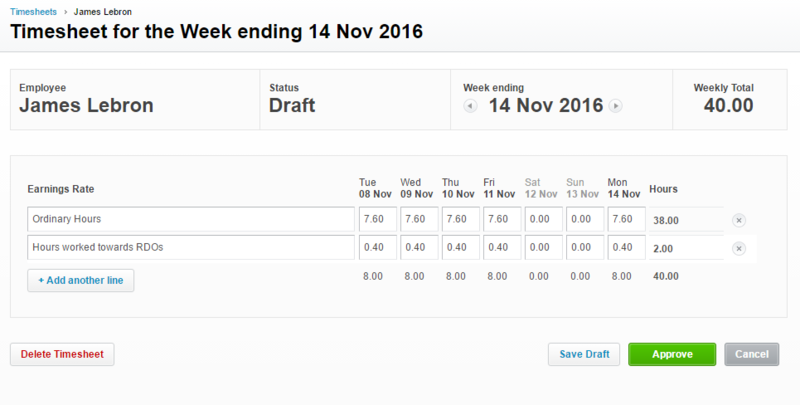 I’ve kept it simple and haven’t bothered with 0.4 unpaid hours for the four days that were worked. The fifth day of 7.6 hours will get added via the approved leave application when you enter the pay run. Let’s have a look at a pay run now, broken down into the top and bottom sections again across two screen shots. You can see in the first screen shot that the hours are locked again. The pay run has drawn the ordinary hours from the timesheet and the RDO from the approved leave application. If you compare it to the screen shot earlier, you’ll see that the dollar value is exactly the same, as we’re still paying 38 hours. In the second screen shot you’ll see that the hours for RDOs are zero this pay cycle. Unless the employee has worked unpaid hours that they are accruing towards their RDO balance, this should be zero. Remember that the pay run only shows hours accrued, not hours used, or taken. Click here to see what the pay slip looks like to the employee on a week we’re they’ve taken an RDO. The bottom section shows that 7.6 hours of leave have been taken and that the employee has a balance of 0.4 RDO hours remaining.